We study homogeneous gravitational instantons, conventionally called the Hawking-Moss (HM) instantons, in bigravity theory. The HM instantons describe the amplitude of quantum tunneling from a false vacuum to the true vacuum. Corrections to General Relativity (GR) are found in a closed form. Using the result, we discuss the following two issues: reduction to the de Rham-Gabadadze-Tolley (dRGT) massive gravity and the possibility of preference for a large e-folding number in the context of the Hartle-Hawking (HH) no-boundary proposal. In particular, concerning the dRGT limit, it is found that the tunneling through the so-called self-accelerating branch is exponentially suppressed relative to the normal branch, and the probability becomes zero in the dRGT limit. As far as HM instantons are concerned, this could imply that the reduction from bigravity to the dRGT massive gravity is ill-defined. 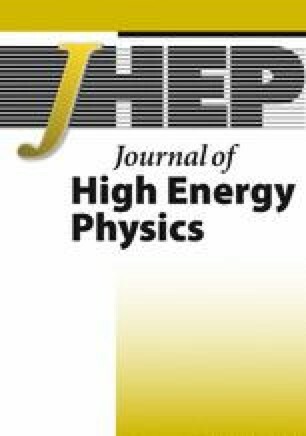 D. Comelli, M. Crisostomi, F. Nesti and L. Pilo, FRW cosmology in ghost free massive gravity, JHEP 03 (2012) 067 [Erratum ibid. 06 (2012) 020] [arXiv:1111.1983] [INSPIRE]. L. Susskind, The anthropic landscape of string theory, in Universe or multiverse?, B. Carr ed., (2009), pg. 247 [hep-th/0302219] [INSPIRE]. S.F. Hassan, A. Schmidt-May and M. von Strauss, Higher derivative gravity and conformal gravity from bimetric and partially massless bimetric theory, arXiv:1303.6940 [INSPIRE]. S.J. Robles-Pérez, Creation of entangled universes avoids the big bang singularity, arXiv:1311.2379 [INSPIRE]. L. Heisenberg, Quantum corrections in massive bigravity and new effective composite metrics, arXiv:1410.4239 [INSPIRE]. A.E. Gumrukcuoglu, L. Heisenberg, S. Mukohyama and N. Tanahashi, Cosmology in bimetric theory with an effective composite coupling to matter, arXiv:1501.02790 [INSPIRE].